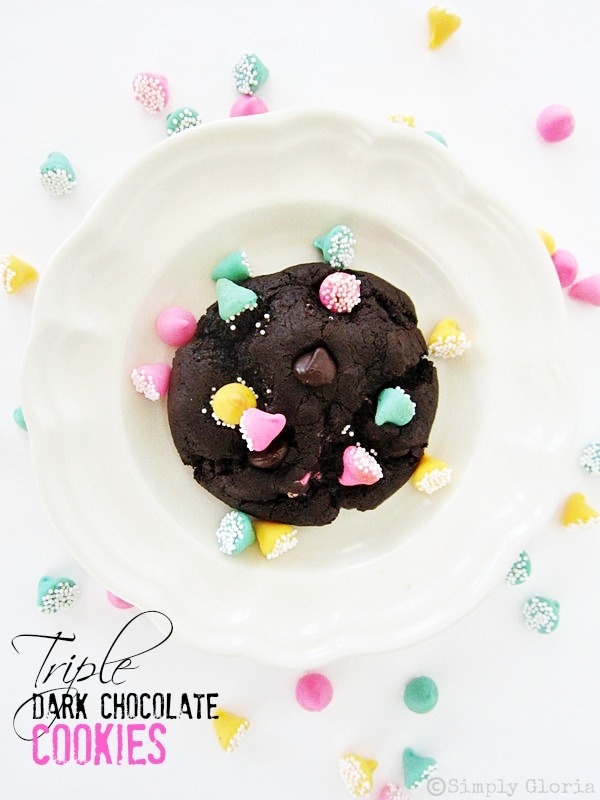 These Triple Dark Chocolate Cookies are SUPER soft and chewy! 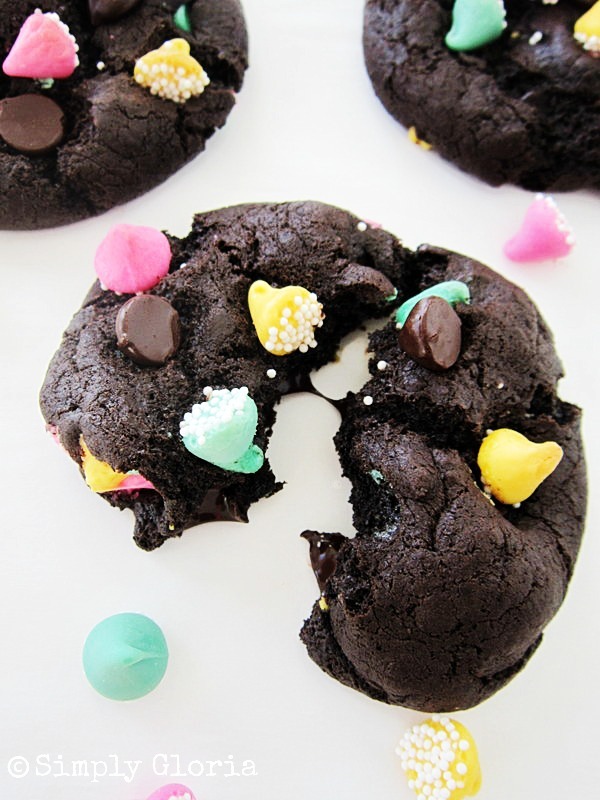 The dark chocolate is literally swimming all around this cookie. But don’t be intimidated by dark chocolate…this chocolate cookie is sweet, not bitter! Melt the butter in a large sauce pan. Once it is melted, take off heat. Add some of the dark chocolate chips to the melted butter and stir until melted. Use a medium cookie scoop for uniform sized cookies. Add some more chips onto the top for more chocolate and color. Bake in a preheated oven at 350 degrees for 8-10 minutes. Allow the cookies to finish baking on the baking sheet for another 5-7 minutes after you take them out of oven. These are the deepest, darkest, chocolaty cookies that for any chocolate lover! 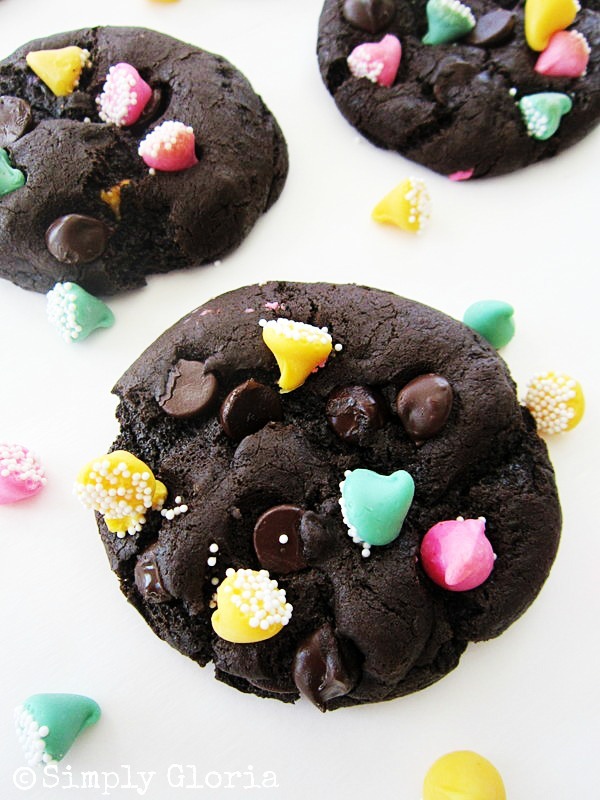 Enjoy sinking your teeth into these soft, deep dark chocolate cookies! This recipe makes about 2½ dozen. Keep in a tightly closed container and they will stay soft for up to 5 days. 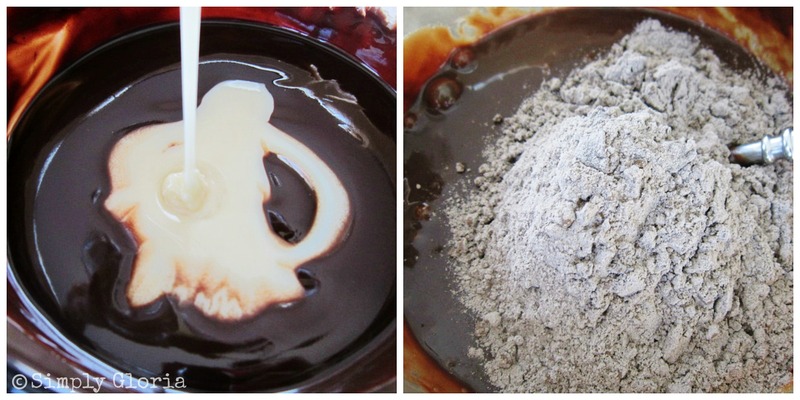 Whisk together the flour, dark chocolate cocoa, and baking soda in a medium mixing bowl. Melt butter in a large sauce pan on medium heat. 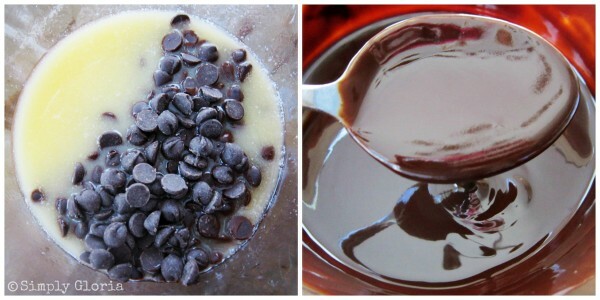 Take off heat and add 1 cup of dark chocolate chips and stir until melted. Pour sweetened condensed milk into the melted chocolate mixture. Add vanilla and beaten egg. Stir. Gently fold in the flour mixture into the chocolate in the sauce pan. Once all combined, stir in ¾ cup of dark chocolate chips and ½ cup pastel nonpareil mint chocolate chips. Use a medium cookie scoop for uniform sized cookies. 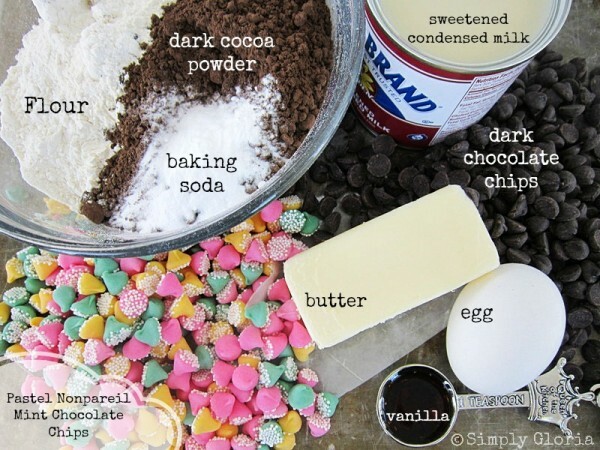 Add the rest of all the chips onto the tops of the shaped cookie dough for more chocolate and color. Bake in a preheated oven at 350 degrees for 8-10 minutes. Allow the cookies to finish baking on the baking sheet for another 5-7 minutes after you take them out of oven. This recipe was modified from The Nestle Best Ever Cookies cookbook. Gloria ,these sound totally decadent and delicious! I love the pop of color from theming chocolate chips, and I’ve been known to eat THOSE right out of the bag! 🙂 Great recipe…pinning! Have a fun and happy weekend! Cindy Eikenberg recently posted…Triple Peanut Butter & Chocolate Chip Cookie Favors for Meghan’s Birthday Party! Hope you have a wonderful weekend, Cindy! I LOVE That there’s a can of sweet cond milk in them! WOW! I love SCM and have never made cookies using it – bars, ice cream, candy, fudge but never cookies. Love these! And the colors are so pretty! So eye-catching. Pinning! Thank you so much Averie! The SCM is what makes these so soft for days. I look forward to when I open up a can…so I can take a (few) spoonfuls that didn’t quite get into the bowl for the recipe! That is so sweet to hear (or I should say, read)! Thank you Pamela! Okay, triple chocolate sounds awesome but triple DARK chocolate sounds like heaven! These sure are DARK chocolate heaven! Thank you Janine! Oh WOW, these look amazing Gloria! Triple dark chocolate? Yes please! And a glass of milk to go with. 😉 I love the color chips on top and the photos are absolutely stunning! Pinning! Yes, you definitely have to have a glass of milk to go with these babies! Thank you for the mention this weekend with the tweet, Anne! Hugs! I LOVE these Gloria!! 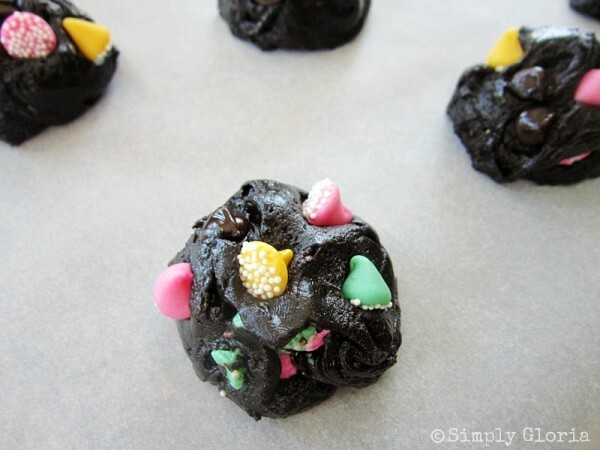 The colorful nonpareil mint candies are perfect and make these cookies more fun than any other cookie I’ve seen. The sweetened condensed milk hiding in this cookie dough is so intriguing. 🙂 These are gorgeous and so fudgy! I’m absolutely loving dark chocolate lately too!! I never used to, so it’s weird. Love these! Ashely, I was the same way as well…never cared for dark chocolate until now. And, now I simply can’t get enough of it! I’m going through the dark cocoa powder so much…wishing that Costco would hurry and put some on the shelves instead of the plain regular chocolate baking cocoa! Thanks Ashley! I’m in love with these cookies! You had me at chocolate. 🙂 And I love how gorgeous they look with the pastel chips. Really, really a winner here and I can’t wait to try these. I LOVE peanut butter but I definitely love chocolate too! Pinned and shared on Facebook. These look great, Gloria! Thank you Julie! I love those two as well…But really anything with sugar and I’m good to go! Yes, this is definitely NOT the healthy site…it’s all about butter and sugar and heavy whipping cream…lol! Thanks Ashley! Anyonita recently posted…Tasty Tuesdays #15 + 9 Recipes You’ll Love & New Co-hosts! Goodness Gloria! These are beautiful. 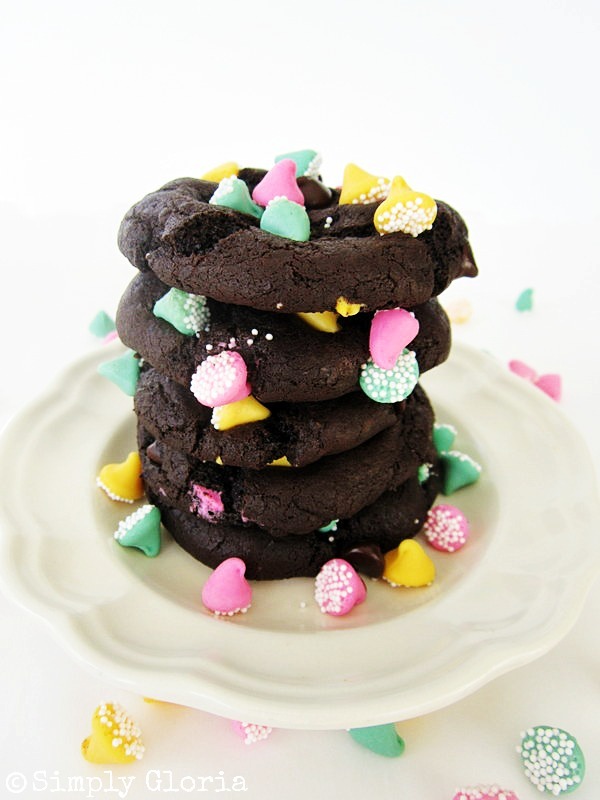 Who doesn’t like dark chocolate cookies but the pastel mint chocolate chips are definitely stealing the show! Love it! I’m surprised the non- nonpareils didn’t melt! did you add them in later in the baking process? Well, (short) story…the bagger boy at the grocery store decided to put my (pricey) nonpareils beside a hot deli package in my sack! By the time I got home (I live 30 miles away! ), I realized he ruined my candies…so I chopped them up and put them inside the cookie dough. But the new nonpareils were just placed on top of the dough before I baked them. They really didn’t melt on the tops. But just like when you bake with the white chocolate chips…you have to take them out before they brown on the tips. Thanks so much for linking this up at my “Best Of The Weekend” party Gloria! Featuring you this eve when the new party goes live at 8PM EST. Hope to see you again at the party soon! Have a great weekend! Does this mean 3/4 CUP plus 2 tblspn. It is so interesting! At the first pic, I though it was a handmade craft because it looked like a flower with the plate. So nice!